This March the choir ventured north for a four-day tour of Durham. After a very early start we arrived at St Chad’s College, where we would be staying for the next three nights, ideally situated a mere fifty metres from Durham Cathedral. The rest of the afternoon was spent taking in some of Durham’s main sights, including the Norman castle, the River Wear and the indoor market. Some of us attended Evensong to get a taste for what would be expected of us before returning to St Chad’s for dinner and a short choir rehearsal. The next morning, after eating a copious English breakfast, we piled into taxis and headed for Beamish, the living museum of the North. A great time was had by all, riding trams, exploring the colliery, visiting the dentist and enjoying the stunning countryside. In the afternoon we returned to Durham for a short rehearsal before singing Evensong in the Cathedral. The choir sounded marvellous in Howells’ Collegium Regale setting of the canticles, with the solo delivered beautifully by choral scholar Crispin White, followed by a sparkling performance of Wood’s Hail, gladdening Light. The Senior Organ Scholar, James D’Costa, rounded off the polished service with Bach’s Prelude in C major, BWV 547. Our first performance over, we retreated to St Chad’s bar which was the venue for some rather competitive table tennis. The following day we drove by coach to Blanchland, a model medieval village which was bought by the former Rector of Lincoln College and Bishop of Durham, Nathaniel Lord Crewe in 1708. After his death it became part of a charitable trust established in accordance with his will. We were shown around the beautiful newly refurbished Lord Crewe Arms Hotel, where we learned all about the Blanchland Estate and the work of the Lord Crewe Trust. We were even able to give an impromptu performance in the medieval Blanchland Abbey before warming ourselves up in the White Monk Tea Rooms. We returned to Durham for our final Evensong, where we performed Sumsion’s setting of the canticles in G and Rheinberger’s gorgeous Abendlied. The voluntary was Buxtehude’s Ciacona in E minor, played by the Junior Organ Scholar, Marion Bettsworth. After the service we were treated to a drinks reception at which we were able to meet members of the Lord Crewe Trust, as well as past and present members of Lincoln College who had attended the service. 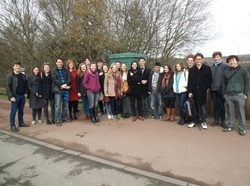 We are very grateful to the Lord Crewe Charity, to Lincoln College and to its alumni for making this tour possible. We would like to thank all those who came to support us in Durham and also St Chad’s College and the staff of Durham Cathedral for being so welcoming and accommodating. Click on the video below to listen to us singing Rheinberger's Abendlied in Durham Cathedral.